9. Direct fit to the B4.1, B44.1*, and TLR 22 families of cars and trucks. (* 3 standard axle shims req’d, available separately). 10. Each set includes 2 spur gears, 3 drive plate, 3 slipper pads, 1 topshaft adapter, 1 spring adapter, 1 spring, and 1 AVID mini decal sheet. 1. 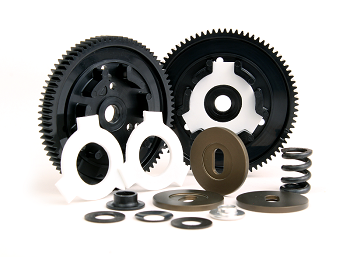 Made in the USA from custom blend low-noise material: Most spur gears in the industry are made from material with glass fibers embedded inside to increase strength, but this also increases noise. AVID Triad Spur gears are made out of a premium high-strength plastic material (3 times the impact strength of delrin) with zero glass. The result is a gear that is both strong and quiet. 2. Precision 48 pitch tooth form: AVID triad gears roll smoothly because of their involute tooth profile which prevents the teeth from dragging as they roll. 3. AVID Triad gears are centerpoint injected for uniform thickness and balance resulting in a true-spinning spur gear. AVID custom tooling ensures the gears won’t wobble! 4. Gears are marked with the number of teeth on the outer ring. 5. Gears are marked for easy assembly with a “1” for 1 plate, and “2” for 2 plate. 6. Available in 69, 72, 75, 76, 78, 81, 84 and 87 tooth configurations.